Most dealerships do not realize the effectiveness of direct mail. Direct mail is a proven platform of marketing, but not everyone has taken advantage of letters, flyers, postcards, and event flyers that can provide more sales for your dealership. There are various types of direct mail pieces that get excellent results for dealership. Below are 9 different types of mail pieces you should be sending to potential and current customers. To get a head start on sales, you may consider offering a special on trade-ins. What is the best way you can let your audience know about the offer you are willing to make on their used vehicle or interest rates available for a new car purchase? With sending out letters to your entire database of customers! You can customize these trade-in letters to make your potential customer feel you reached out to them directly with targeting specific makes and models, or you can save money by offset printing and just share the general news with your database. Do you want an easy way to stock your used car lot with potential customers used vehicles? Why not send out a buyback letter? By segmenting your contacts and targeting potential and current customers, you can increase walk-ins at your dealership. You can use data printing which allows the direct mail piece to be a customized letter for every person. Releases of new models are always a big deal, sometimes the biggest car fanatics don’t get the latest news. 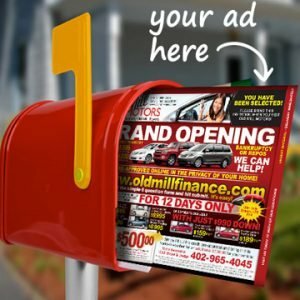 You can take advantage of this by sending out flyers with all the information your potential customers would need to make a decision on a new car purchase. If you have existing customers who have purchased earlier models you can target them to inform them on your latest models and peak their interest in returning to your lot. You don’t always know when buyers are in the market to make a purchase whether it’s new or used, that doesn’t mean you can’t get the word out on a big sales event you are having. Using saturation marketing will help you reach everyone in your backyard with informative information on your sales event. Buying a car is a huge investment, many try to put this off as long possible. By filtering your buyer’s database according to credit history, you can target customers who qualify for financing and take a major step out of the buying cycle. If you can filter your database by buyers with credit scores, remaining payments on their current vehicles, and the amount they typical spend on a new car purchase, you will have a list of customers you can send financing offers to. Financing offers can remove a lot of doubt in the buying process before the customer sets foot into your dealership. This type of direct mail helps buyers who are unsure if they would be approved for financing on a new car purchase. The best way to keep your buyers informed of service options you offer is to send out a blanket piece that makes them aware of all the services you offer like availability on oil changes, tire rotation, body work, mechanic services, brakes and more. Keep your buyers informed with current service specials you have by sending them service and maintenance specials that inform them of any special deals they can take advantage of. If you are a guru in filtering your database, you can even send timely reminders when an oil change is due. It’s hard to believe a buyer would fell remorse after getting behind the wheel of a brand-new car, but it does happen. You can create and send out a targeted card congratulating buyers on the purchase of their new car and a few uplifting points on buying a new car. This sort of positive reinforcement will let them know you are still thinking about them and have their best interest at heart. With this type of direct mail campaign, you often see referrals, positive reviews, and testimonials. Are you ready to start taking advantage of these direct mail campaign options? On Point Marketing has all of these above-mentioned campaigns and more. Give us a call 1-800-771-1563 or shoot us an email Sales@onpointnow.com and we will be glad to assist you.